Game on! Over $10,000 in prizes will be given away during Newbury Comics’ game of seek and find. 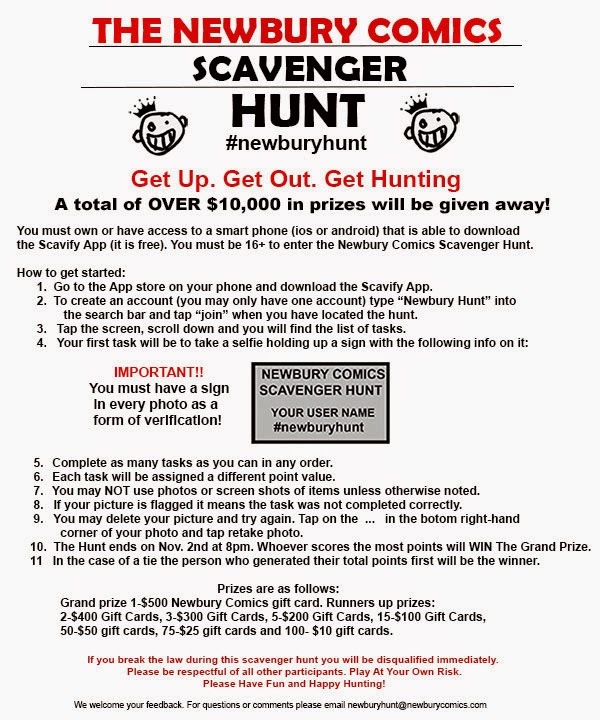 As a smart phone owner who is also 16+, you can register to join the #newburyhunt via free app Scavify, and start your mission by completing a series of tasks, each assigned a different point value. First task will be taking a selfie. Baby steps. But play at your own risk. If you break the law during this scavenger hunt, you’re outta da game. Prizes include the grand prize (1) $500 Newbury Comics gift card, and runner up prizes of (2) $400 gift cards, (3) $300 gift cards, (5) $200 gift cards, (15) $100 gift cards, (50) $50 gift cards, (75) $25 gift cards, and (100) $10 gift cards. Full game information including terms and conditions can be found here.